My father has always been very healthy. And proactive about his health and adheres to a healthy lifestyle. Then suddenly he hit a small bump on the road these last few weeks. Something that is small and he will overcome, but which has made him and I talk more frequently. 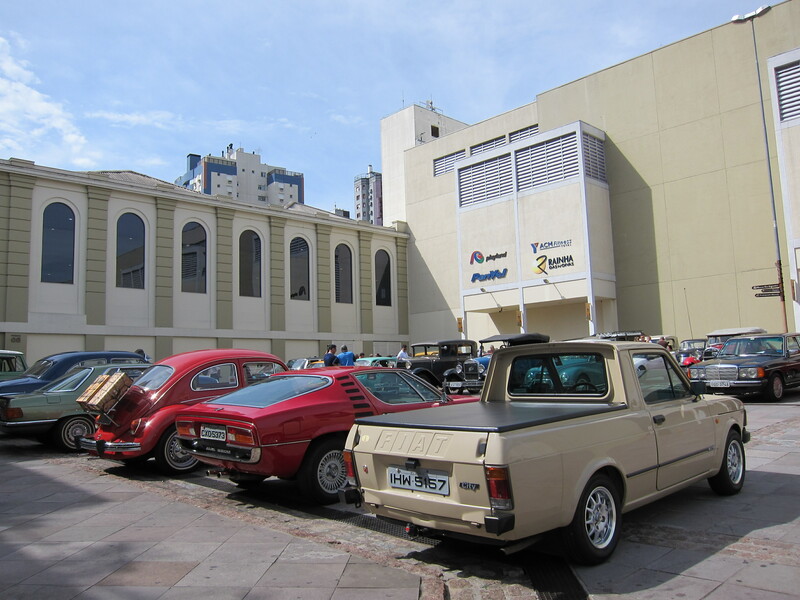 On my last trip to Porto Alegre in April of 2011 I went with my sister and my brother-in-law to a local mall’s parking lot where every Sunday (when the weather is good) people who collect old cars get together to show and talk about cars. I saw there the cars from my childhood. Since that time I have been thinking about writing a post about the cars from the time I was growing up. Since I’ve been talking to my father on an almost daily basis these days, this is a good time to write this story that I’ve been drafting in my mind for a while. 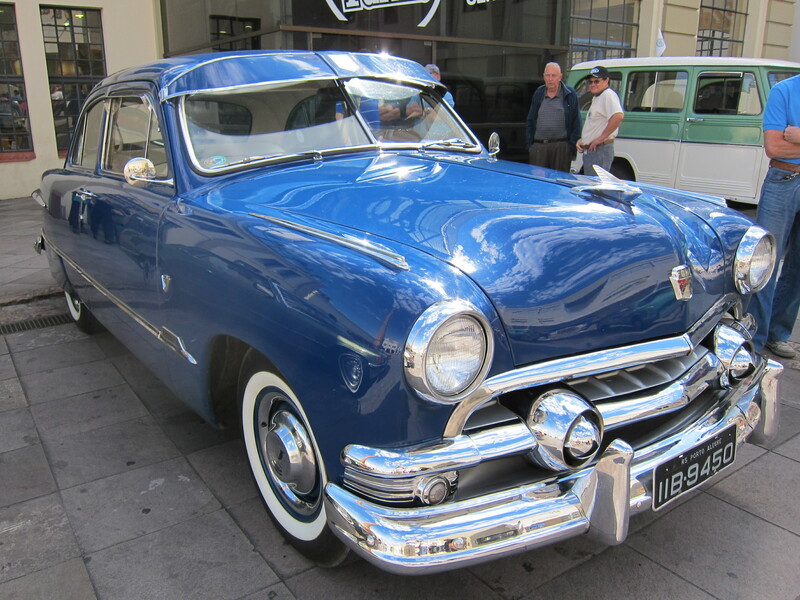 My first recollection of a car associated with my father was a 1951 Ford Custom. 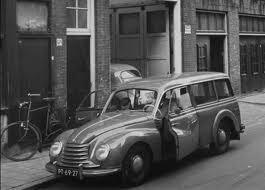 That car belonged to my grandfather and my father borrowed it on a semi-permanent basis. It was light grey, almost white. 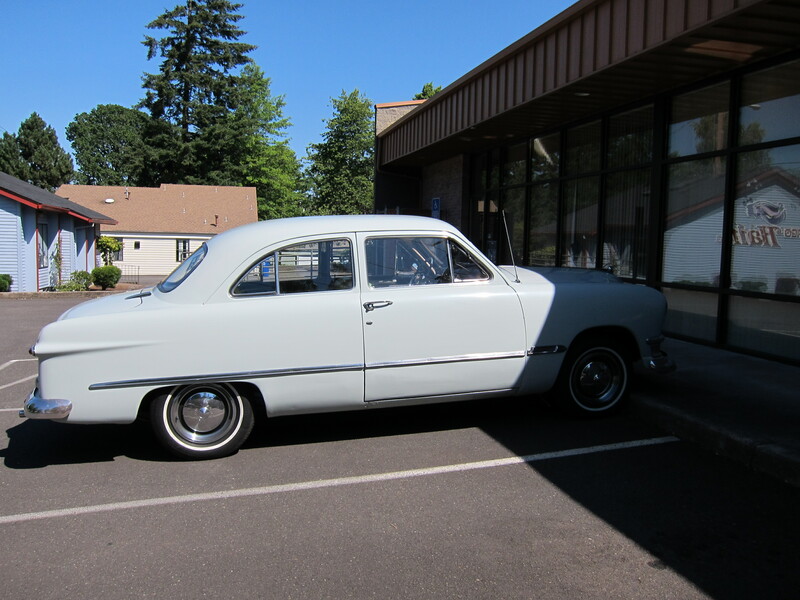 I found the car of the photo below on one of my motorcycle trips last year, when I was traversing the south neighborhoods of Salem, here in Oregon. It was the same color as my father’s car, except my father’s car was a four-door. I actually don’t remember much about this car when my father had it. But I do remember the car several years later, after the time my father eventually returned it to my grand father who then gave it to my uncle, my father’s brother in law. One thing I remember about that car are those screws holding the chrome frame around the windshield. Go figure why we remember such irrelevant details. Thinking about it, I was surprised to realize the car was so much older than me and the time I finally got to register it in my memory. But then, I look in my garage and my Audi is 17 years old. My truck is 16 years old. One other thing I remember about this car was the distinctive front end. The era of the rockets and space exploration influenced the design of cars. This car did not have a fish tail as we got to see in the late 50’s cars, but it had those turbine looking features in the front grill. Ford Custom – Turbine like designs on the front grill. Shopping Total, Porto Alegre, April 2011. 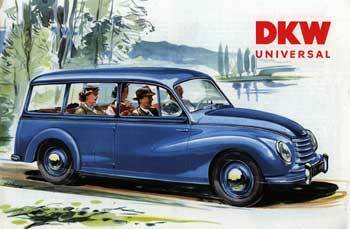 My father’s first car was a 1957 DKW Station Wagon (called Universal, if I remember correctly) that he bought used. This car was interesting and historical in several counts. 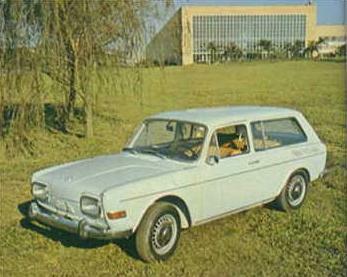 It was one of the first cars made in Brazil. 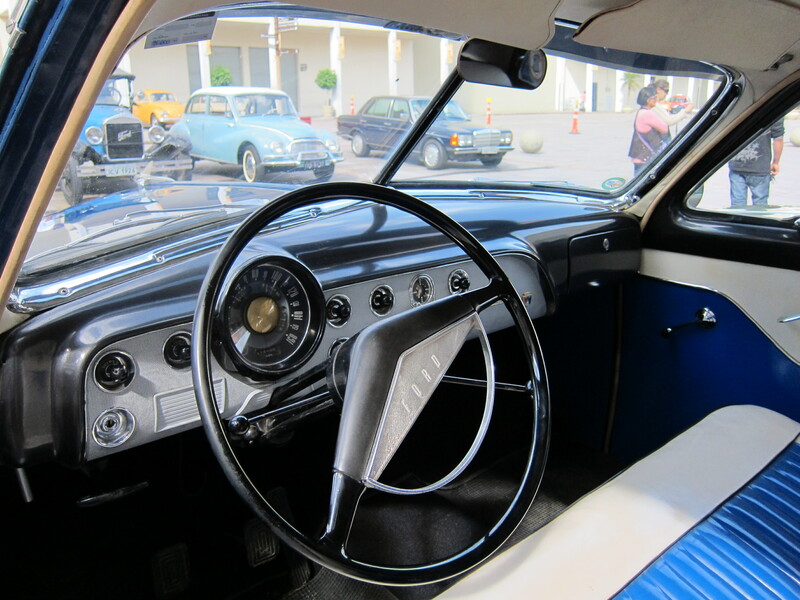 In 1956 a Brazilian maker of agricultural implements (Vemag) bought the rights to make this car in Brazil, production starting in the end of 1956. I assume my father’s car was one of these first cars made in Brazil. I’m not sure if the car depicted on the photo on the left was the exact same model, but if not, it was very similar. And it was of this same color: dark blue. I remember my father took it at some point to a body shop and had all the rust and dings fixed and got it repainted. I remember going to the body shop a few times, I remember the car with primer paint in the areas they worked on the body panels before it was painted. I remember the smell of paint at the shop. I remember the car was originally a darker blue and the repainted version was a mid tone blue. Other interesting bit about this car was its three-cylinder, two-stroke motor that was an evolution of a two-cylinder, two-stroke, motorcycle motor. 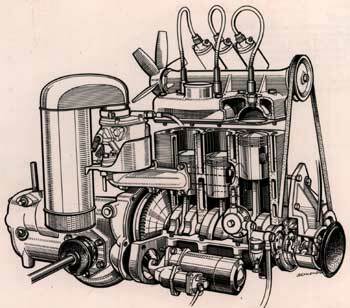 This three-cylinder motor was also used by Saab at some point. I remember the sounds it made, the blue smoke (well, it was a two-stroke motor after all). It sounded like a motorcycle. DKW and the Suicide Doors. Another interesting aspect about this car was that it was a front wheel drive car. So it had the dreadful front axle problems that still plague front wheel drive cars today: the constant velocity joint. I’ve had a few of those replaced in my “modern” cars. But it was worse then. Something else interesting about this car is that DKW is one of the four companies that eventually merged to become the Audi of today. Finally, it had the suicide doors, how cool is that, although I ca imagine it would be unsafe. I have somewhere a picture of me in front of my father’s DKW when I was about six years old. It was my first day of school. When I find that photo I will post it here. But what I really remember well is my father’s first new car. 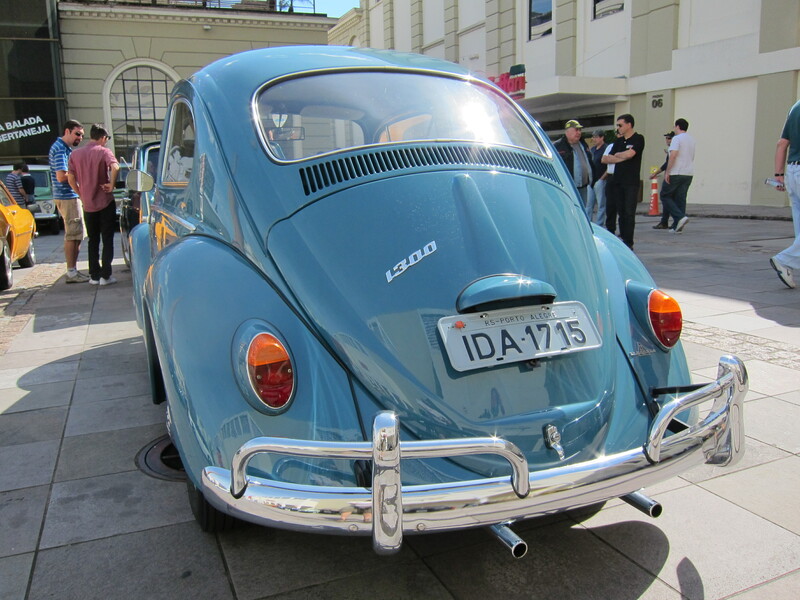 It was a Beetle, a 1967 VW 1300. Blue, exactly the same color as the 1968 car depicted on the pictures below. I remember we were anxiously waiting for this car. 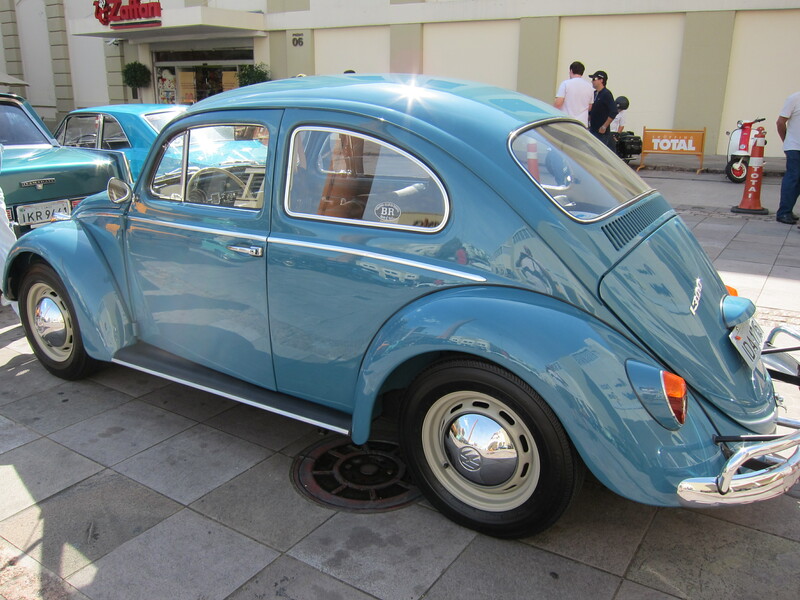 When we heard it from one of the local VW dealers (which was called Carro do Povo, or People’s Car, which means Volkswagen) that the car had arrived, we piled up in the DKW and went to the dealer to see the car. It was after hours, already dark when we got there, and we parked in front of the dealer’s gate and shined the DKW lights towards the yard where all the new cars were parked. There they were, a series of brand new Beetles, neatly parked side by side, waiting to be placed in the show room floor or to go their anxious new owners. There were a few blue ones like we wanted, a few red ones, white and other colors. In Brazil, this slate blue was called Azul Real (royal blue). One more of those things that won’t go away from my memory. 1968 VW 1300. Shopping Total, Porto Alegre, April 2011. Something I will never forget is how, in anticipation for this car my father and I would play the color game. When we were on the road, and I was sitting right behind him on the DKW, I would point to my father the different tones of blue in the cars that I would spot on the road: “Look dad, that is a nice blue color, it would be nice if ours was that same color”. My father sometimes grumbled something back to me. 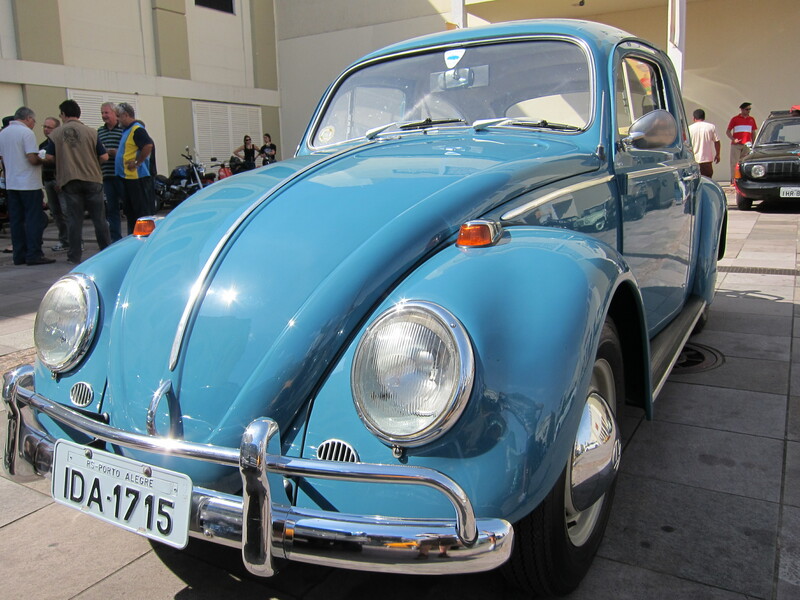 The 1967 Beetle was the second year of this car’s 12V charging system an evolution of the 6V system, and the first year of the 1300 motor, an upgrade from the 1200 motor. 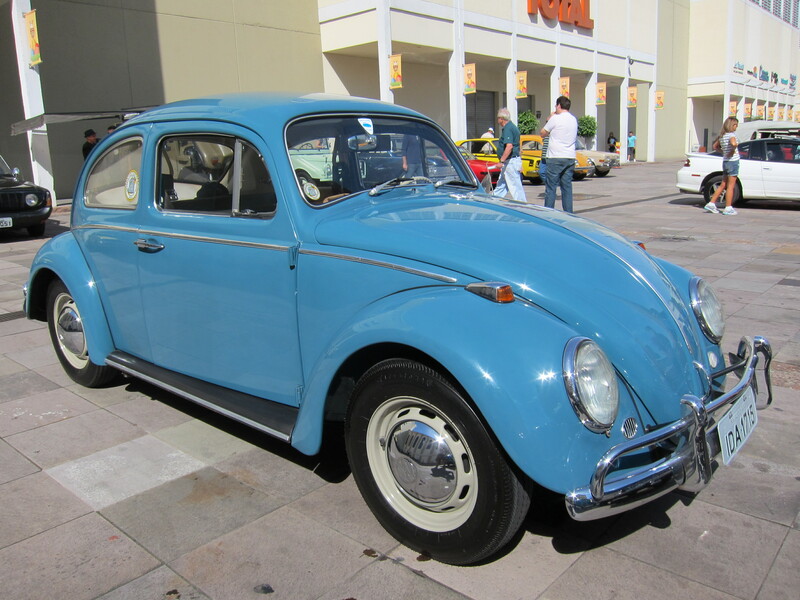 In 1971 my father passed this car on to my my mom and bought a VW Variant, a square back. 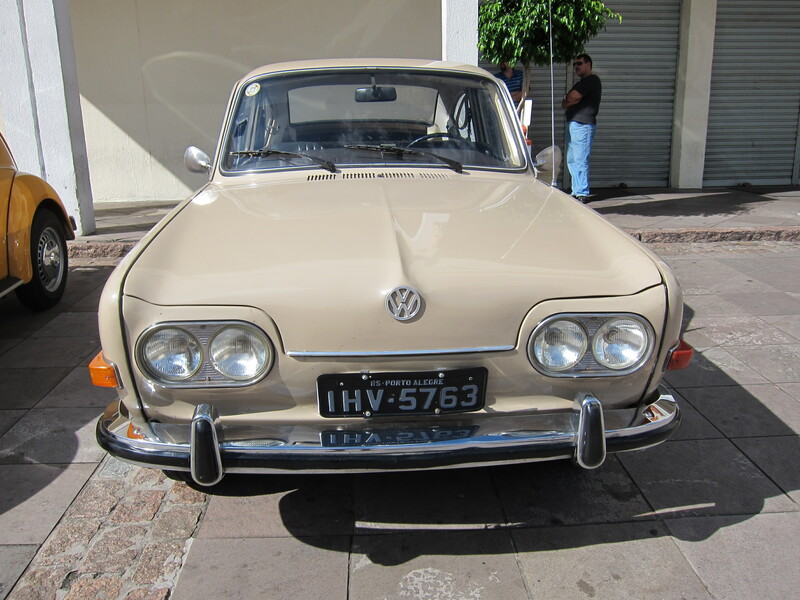 It had the “pancake” motor, a flat version of the VW air-cooled motor, with 1600 cc. 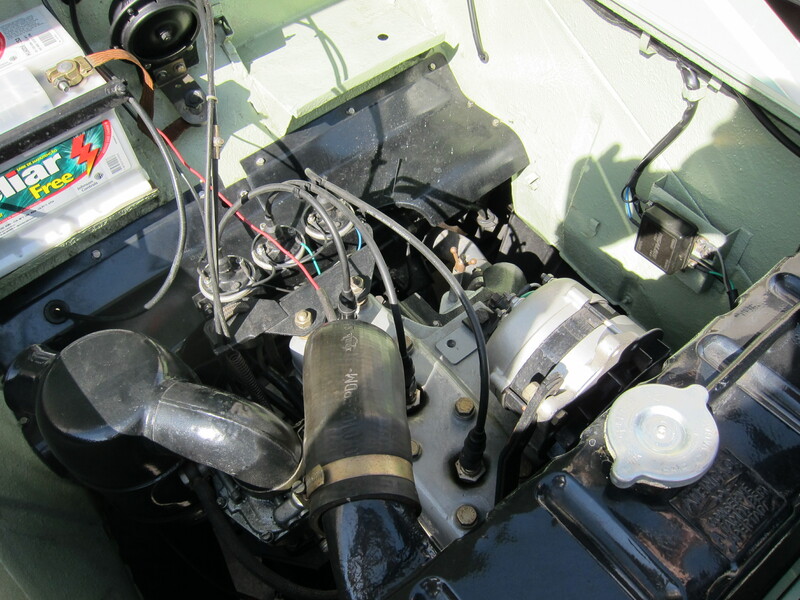 This flat motor allowed the car to be a station wagon, with cargo space in front, as all VWs of that time, and also in the back of the car, on the top of the motor. My sister and I were in school, on a Saturday morning, when my father went to pick the car up. We were waiting for him to pick us up, classes ended around 10 am on Saturday mornings (do people have school on Saturdays these days?) and he was late. I was anxious to see the new car. After we waited for a while, everyone had left school, we decided to walk back home. About a couple of blocks on our way and we saw the car. Dad picked us up and we rode home for on the new VW Variant for the first time. The color was a light blue, called Azul Diamante (Diamond Blue) similar to the one on the left. 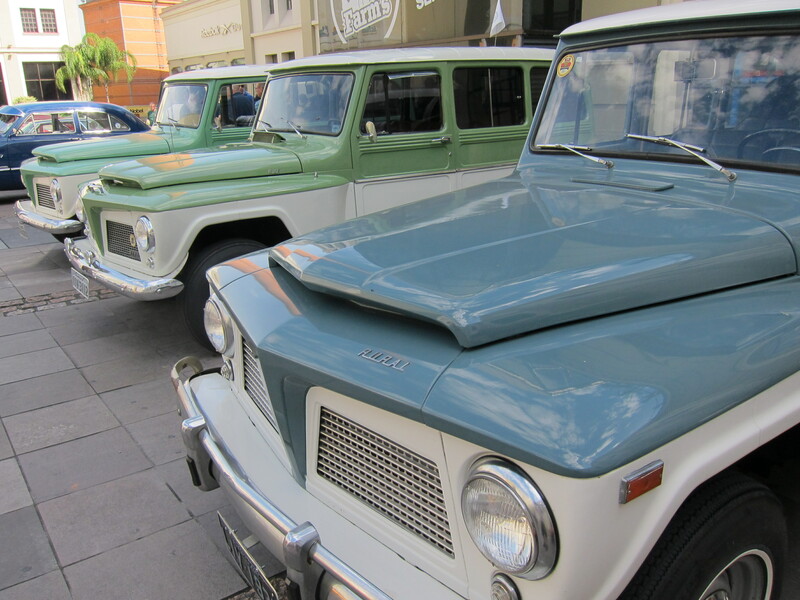 Except that the one on the left was a 1970 model. My father’s Variant had the front end exactly like the car below (the car below is the 1971 fast back version of the car). From here on, my father bought several other cars. Mostly VW’s and a couple of Fords. Now he drives a VW. I follow a similar trend, as I currently have an Audi (from the VW group) and a Ford F150. Since we are on the car subject, as I described in the “why I ride section” of this site, I was always very mechanically inclined. My father is a very patient person. He had to be. I was a back seat driver from an early age. 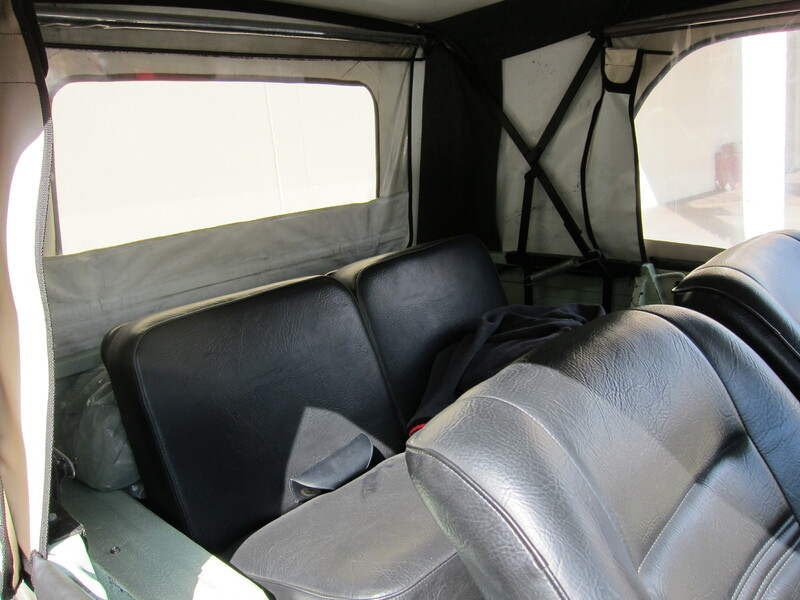 We were four children (three sisters and me) and I had permanent dibs to a place in the rear seat of the car. My place was by the window, right behind my father. My older sister’s place was by the other window behind my mom. My two younger sisters sat in the middle. Of course no seat belts, no car seats. But the point I want to make here is that sitting right behind my father I must had been an annoying little kid, as I kept telling him to change from 2nd to 3rd gear or from 3rd to 4th when I heard the motor over rev. Or I would tell him to downshift when it was clear he was lugging the engine. Nobody ever told me how to drive. I learned by ear, by paying attention to what people did to drive the car. 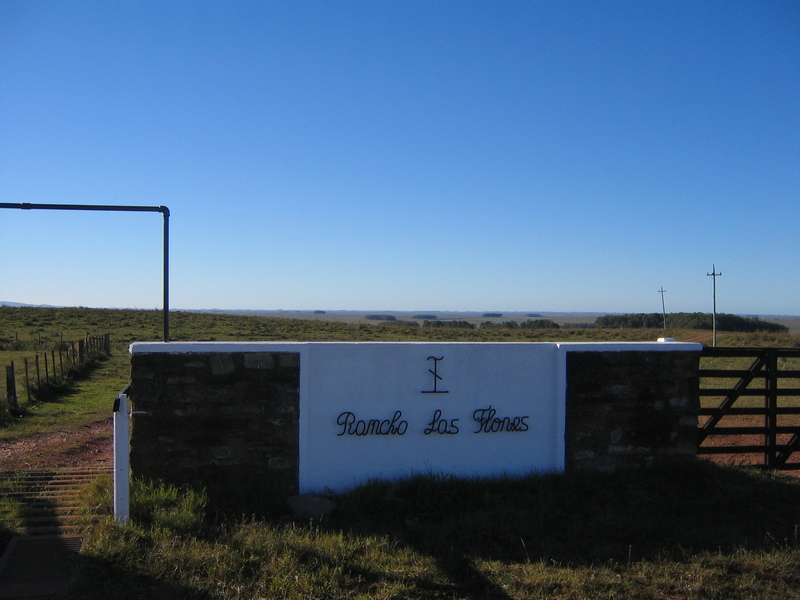 Rancho las Flores, Uruguay. Where I drove for the first time. What happened is that on the summer I turned 12, I was at my uncle’s cattle ranch in Uruguay (Rancho las Flores, but better known as Sanga-Funda) and a friend of my cousin showed up for a visit on a Rural Willys (a Brazilian made version of the American Willys) very similar to the ones pictured above. My cousin’s friend one day asked me if I had ever driven a car. I said no. So he asked whether I would like to drive. I said yes. So I drove his car from the ranch house to the front gate, which was about a mile long. Photo below is that exact road. 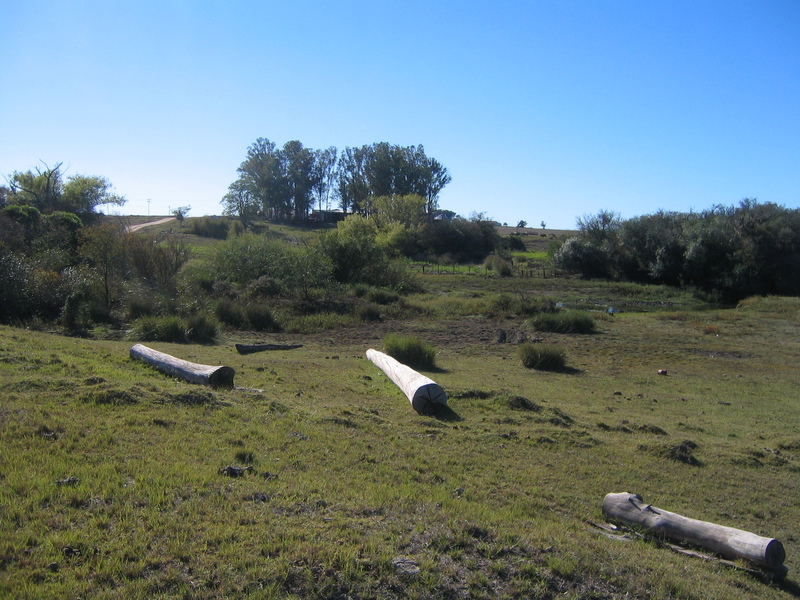 The access road in the Rancho Las Flores. Photo from April 2006. He did not explain much to me. He asked if I knew what I had to do and I said yes. 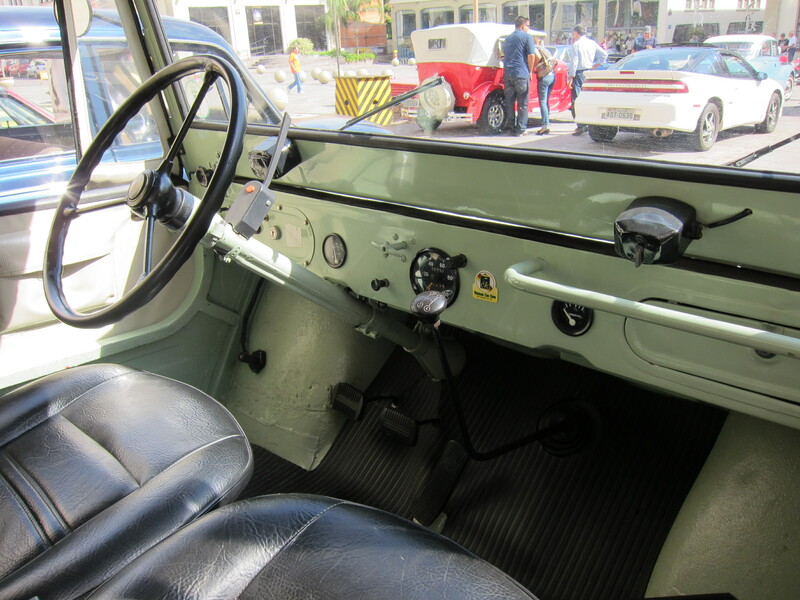 So he told me two things: 1) the steering wheel has a half turn “play”, so you need to do half a turn until it “catches” the front wheels; and 2) it had a three-speed gear lever on the steering column, first down, second forward and up, third forward and down again. 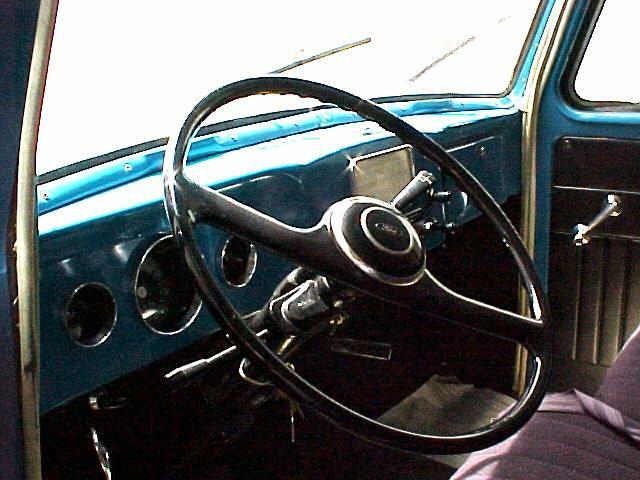 The second gear, he mentioned to me, was disengaging by itself, so you have to hold it up when driving on second gear. And I was proud of my accomplishments. After so many years as my father’s back seat driver, I was able to perform without a flaw. It was hard to keep it going on the path I wanted because of the steering play. But with all of that, being my first time putting in practice what I had been theorizing for several years, holding the second gear up when on second gear, driving with one-hand the steering with that play, I have to say it was a great accomplishment. 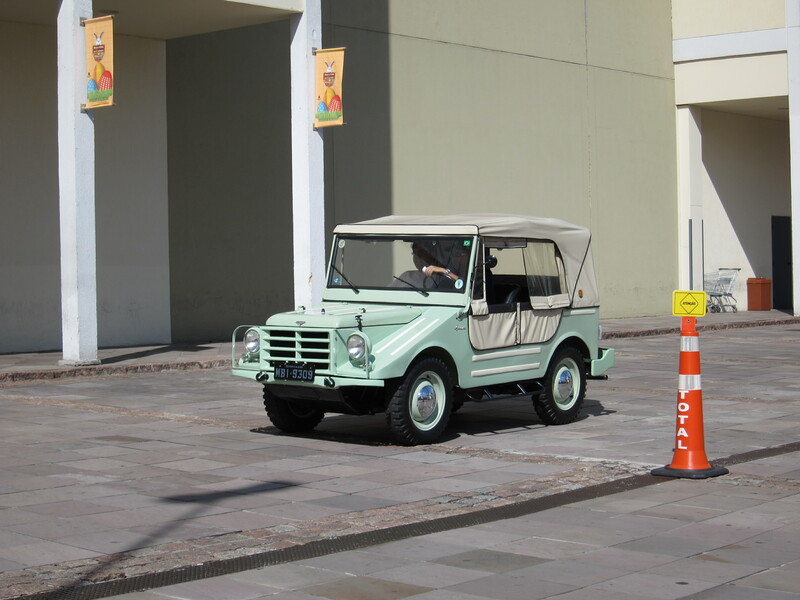 One more important car in my family history is the DKW Candango, the Brazilian version of the Munga. 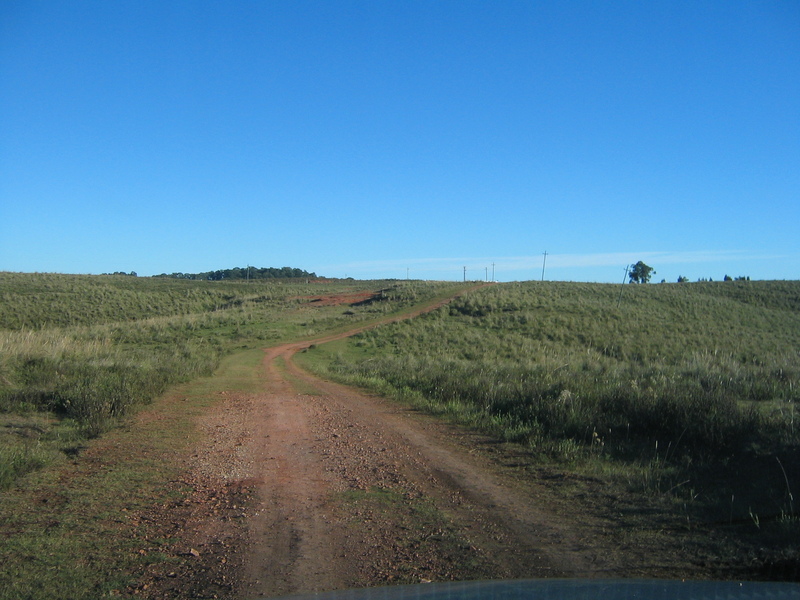 Still today, to go from the city of Bagé in South Brazil, where relatives from my mothers’ side still live today, and go to the ranch in North Uruguay, the 100 km of dirt roads (some of it has been paved more recently, but not all) can be really treacherous, especially in the border area between Brazil and Uruguay. 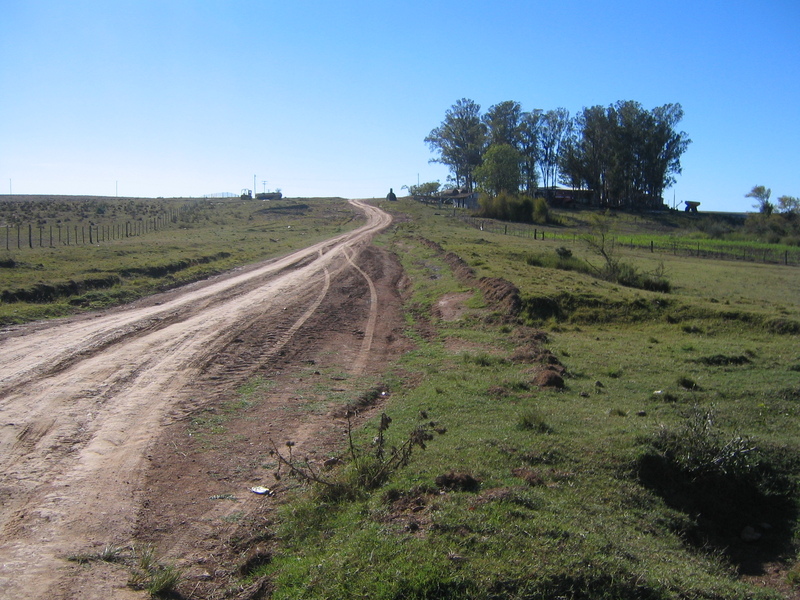 For several years, this border was unmanned or unrecognized and did not have an official road. To cross the river, the locals built wood bridges that often got carried down the river when it flooded. It still is a problem today. But much more of a problem during the time I was growing up. My uncle had one of these Candangos and this was the best car to have for those roads. I don’t know how we all fitted on this small car. My uncle, my aunt, my cousin, my sister and me (my younger sisters were not participating on these adventures yet). My uncle had a trailer, a steel trailer, that carried all the supplies for the several weeks we would stay at the ranch. And he drove on these roads, with mud and all the challenges these primitive roads had (and still have) with this loaded vehicle, plus the trailer. My uncle’s Candango was a four-wheel drive version. Till today I can’t imagine how this small motor, less than 1 liter, could carry all that weight. 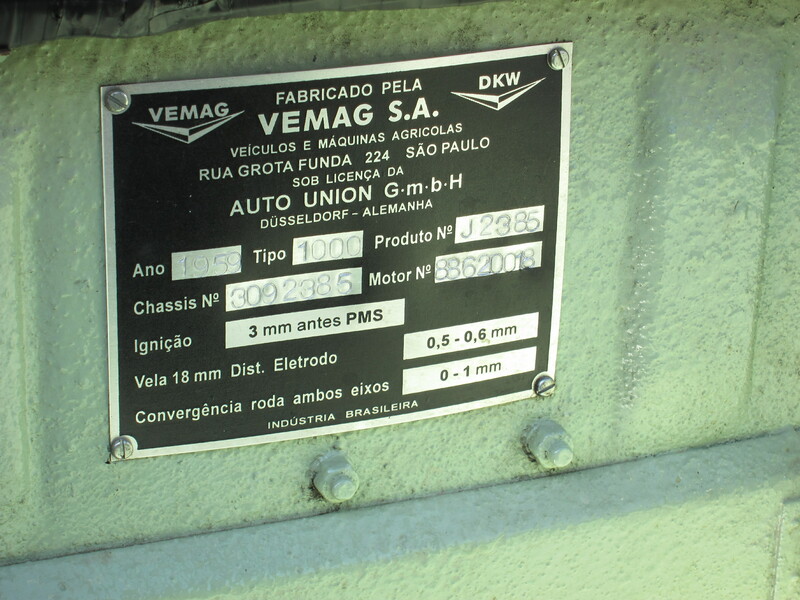 This car was made by Vemag in Brazil, similar to my father’s 1957 DKW. I find it incredible that this motor, a three-cylinder, with slightly less than 1 liter displacement, cranked about 50hp, and could accomplish all of that. It should be of note that this little motor survived beyond DKW or Saab, and showed up in a car that was made well into the 80’s and possibly early 90’s, the infamous Trabant of East Germany. 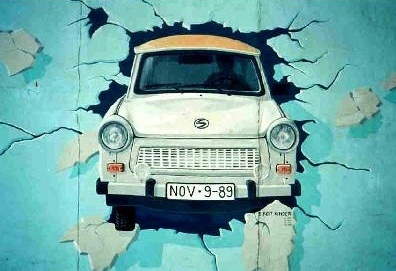 Berlin Wall Trabant. Graffiti by Bogdangiusca. Incidentally, my Triumph motorcycle has a three-cylinder motor, with a slightly smaller displacement (800cc), and cranks 95hp. Well, that was a nice trip on memory lane. I always wanted to talk about these stories about my father and his cars. This blog and my father’s recent small bump on the road, offered me a great opportunity to do it. This entry was posted in Porto Alegre, The Book and tagged brazil, cars, childhood memories, father, porto alegre, travel, uruguay. Bookmark the permalink. E’ isso ai Veinho! Grande abraço! Nothing I like more than going to a site and seeing such awesome photos of VW bugs! Makes me long for the old days when I spent many a moment riding in (and pushing) these beautiful pieces of art! Your photos are fantastic!!! Thanks for the trip down memory lane!! Indeed Jess. I had a couple of air cooled VW’s myself. One of them, with a recurring battery charge problem, that I used to push-start by myself. Parabens pelo post, muito legal!! Gostaria de falar com o proprietário do jipe Candango sobre a numeração do produto e a numeração do chassi impressos na plaqueta. Agradeceria o envio de dados para contato. Obrigado. Infelizmente nao conheco o proprietario daquele Candango. Sei que este grupo de pessoas se reune todos os domingos naquele mesmo local, e que portanto, entre eles deve haver quem sabe sobre o proprietario daquele Candango caso eles nao comparecam em algum domingo. E como eu nao moro em Porto Alegre, tenho minimos recursos para descobrir que e’ esta pessoa. Obrigado por teres lido meu post! I just read your posts about the blue beetle. I like your impressions so much. I’ll never forget the evening our dad arrived home with the new car, the blue beetle. Our sister and I were at home, waiting at the front window. We were all cheerful!